You may be familiar with the terms Lesbian, Gay, Bisexual, Transgender (LGBT) which are important identities for many of us, but for others they may seem like labels that may limit or wrongly label some of us. For more information on our Helpline or to complete our contact form: https://outlinesurrey.org.uk/contact-helpline/ . Where in the UK do Outline Support? Outline was established in the County of Surrey an area comprising of a number of highly populated Towns and Villages in the South East of the UK. Outline primarily looks to provide a focused service in the Surrey and connected areas, however we would always welcome contact to our Helpline service and website for people inside and outside of Surrey. 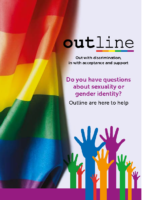 Due to how sexuality and gender identity support is not consistently provided in area; Outline aim to be knowledgeable of support and events in Surrey and the surrounding area. Some great information and facts about the area of Surrey where Outline are based can be found on Surrey-i.